Using systemic thinking to make sense of new-normal levels of social, political, economic, and ecological complexity. I’m a systems thinking theorist and for the last three years I’ve been working with my colleagues Ellen Lewis (Ethos of Engagement Consulting) and Shravanti Reddy (UN Women’s Independent Evaluation Service) to write a comprehensive field guidance on systemic evaluation. 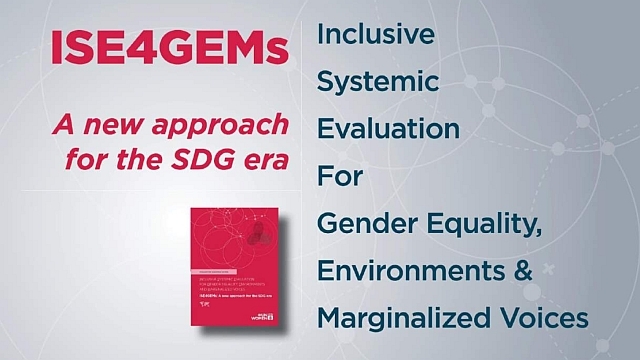 The Inclusive Systemic Evaluation for Gender Equality, Environments and Marginalized voices (ISE4GEMs) Guide is now on the BetterEvaluation website. The three of us have embraced systemic thinking and wanted to provide guidance that demystifies systemic thinking and complexity science concepts, walks one through the process of evaluation using systemic thinking, and provides tools, examples and activities, to ‘be’ an inclusive systemic evaluator. What makes it almost unique is that it is essentially a soup to nuts evaluation manual rather than a general description of a particular evaluation approach. We think that these skills are apposite for working in uncertain times, which both characterises and clichés life in the 21st Century, but more specifically, if we are to meet the goals of the 2030 Agenda: the [Sustainable Development Goals]. Professor Thomas Schwandt summed it up perfectly in a captivating presentation he gave at the 2018 European Evaluation Society conference. He argued that we live in ‘post-normal’ times. Drawing on the seminal work by Silvio Funtowicz and Jerome Ravetz, post-normal science contrast to traditional problem-solving strategies by accounting for complexity, emergence and plurality. In a democratic mode it responds to what might be appropriate, rather than what should be done. He suggests we think about evaluation in new ways, as we work in a post-normal evaluation era. One that calls for us to use systemic thinking to make sense of new-normal levels of social, political, economic and ecological complexity. And this is what, we believe as authors, we are endeavouring to achieve with the release of the ISE4GEMs. More than a description of systems thinking, it provides a primer in systemic evaluation for practice. Our intention is to be your thought partner, to help you reflect on the work you are being asked to do as you unfold your understanding of the evaluation. We then provide guidance with the detailed steps one might take, to do a systemic evaluation. We created tools to work with and resources to draw on. And, further to this, we’ve used the approach, as we were writing it. So many examples from our practice and others are embedded in the guide. Why is this different? Because there are not too many guides that have reviewed the literature and carefully chosen techniques, strategies, ideas and concepts from across the disciplines of evaluation, systems sciences and feminism, and spill over into a range of social and environmental science disciplines as well. We have selected key ideas and established a framework that generates practitioners’ knowledge and capacity to ‘do’ systems thinking, rather than just have a better general awareness of the theory. We invite all evaluators, emerging or experienced, who are interested in using the ISE4GEMs to have a go and let us know as your thought partners what works, what doesn’t and how we can make the approach better. We have an active research program to investigate inclusive systemic evaluation. We want people to experience the approach and tell us how it needs to be improved, that includes the ISE4GEMs toolkit, theory (Part A) and guide (Part B). Our community of practice will shape the ISE4GEMsV2 and together we can make better sense of our complex world. Article source: Better Evaluation, CC BY-NC 3.0. Anne Stephens (Director, Ethos of Engagement Consulting and Lecturer, James Cook University), Shravanti Reddy (Evaluation Specialist, UN Women), and Ellen D. Lewis (Ethos of Engagement Consulting)​.